TrustMovies has so far devoted his time to movies of the foreign, independent and documentary type, with the occasional foray into cable TV (mostly of the foreign sort). And yet "content" -- that all-purpose word now used to refer to just about anything made to entertain, inform, move or amuse us -- has suddenly become so prevalent and all-over-the place (it's everywhere you look) that it behooves me to occasionally cover something different and perhaps more au courant. 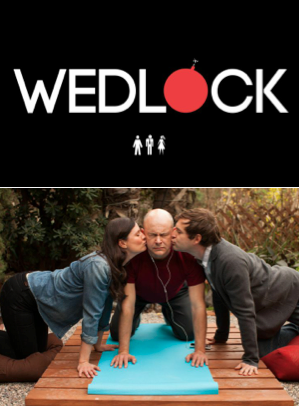 Today, because I am particularly taken with the three lead performers, I've just viewed WEDLOCK, a series of ten five-minute episodes about two people -- (Jennifer Lafleur and Mark Duplass) who visit a well-known and much-loved therapist (Rob Corddry) who is famous for his wonderful counseling involving couples. OK: Things begin to go a bit downhill around the halfway point or just after. Nothing major bad, mind you. 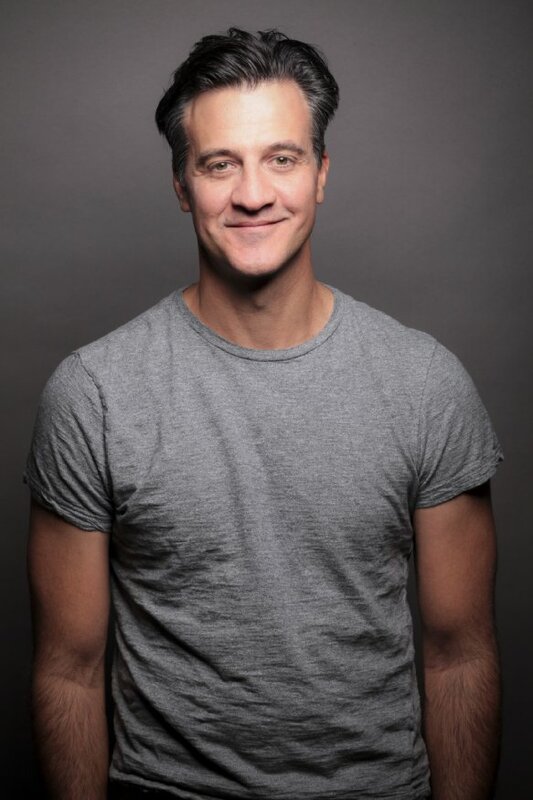 You'll still laugh pretty consistently, but some of the truly creative stuff that happens early on seems to have disappeared. 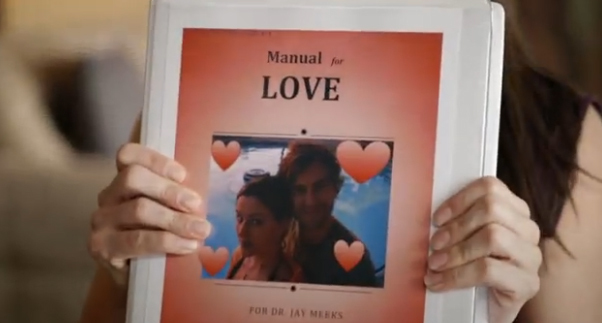 The first half of these episodes are so funny, odd and surprising -- dealing with everything from the initial premise (a hoot and a half) to cross-dressing, doll play, ex-girlfriends and a very special "home-made" manual (above) -- that the final ones break little new ground and instead seem to have been created more out of the simple need to fill the rest of the time slots than anything else. Fortunately the cast is first-rate. 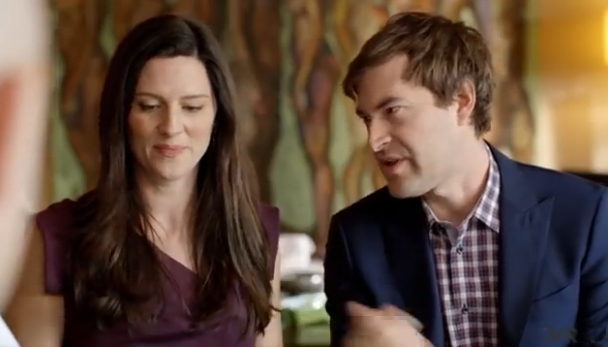 Lafleur and Duplass (above, left to right) are fine actors and good comedians, too, and they keep things rolling along. 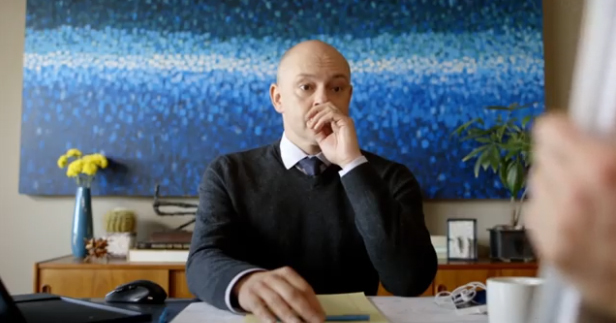 Corddry (three photos up and below, center) is, as usual, an extraordinary delight and one of the funniest "straight men" ever. Also in the mix are Ed Begley, Jr. and Katie Aselton to provide even more laughs and fun.